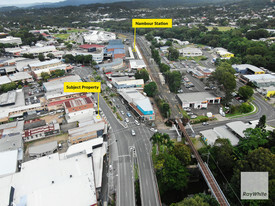 350 Commercial Real Estate and Properties in Sunshine Coast are listed in 9 categories. We have 233 Offices for Lease , 217 Retail Shops for Lease , 192 Industrial Warehouses for Lease , 14 Medical and Consulting Properties for Lease , 8 Development Lands for Lease and 4 Showrooms for Lease . Retail With Bulcock Street Exposure $29,052 pa + GST + Outgoi.. 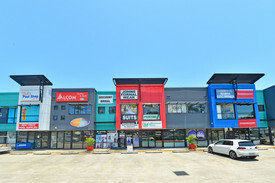 This great retail/office unit is located on the corner of Aerodrome Road Sixth Avenue, in one of Maroochydore's most prominent locations. 32m2 Renovated internally, the unit includes a kitchenette and glass frontage, allowing any new business to maximise on the high exposure this premises receives. For more information, or to inspect the premises, please contact Jordan Hayes on 0417 999 331 or Michael Shadforth on 0488 981 076. Two tenancies available for lease (31m2 or 56m2) First floor office suites Perfect for professional service tenants wanting to be positioned in the heart of Nambour CBD Very affordable rental with outgoings included to make for one easily monthly rental payment Term of lease is flexible Located on the main Street of Nambour, Currie Street Positioned amongst other well established tenants On street car parking car parking at rear of building Contact our marketing agents for further information or to arrange an inspection! 'Work Tank' is a place where you can run your own business without having to worry about the time and cost of running your own premises. Work Tank' is designed to save you money in upfront costs and it means that you do not have to sign a long lease but allows you to meet and greet your clients and you have use of a beautiful 12+ person boardroom complete with 75 inch TV with HDMI connection, wireless internet and coffee facilities Internet is also covered in the rental so you have access to high speed NBN at no additional cost to you The office spaces are all air conditioned and the reception is available for your clients as a waiting room Kitchen toilet facilities available One exclusive car park for staff with each office and ample visitor car parking on site and on street Work Tank' offices are situated in a high profile location on the corner of Woomba Place and Brisbane Road in Mooloolaba. Walk to shops, cafes, restaurants, or take a break by the nearby canal on the seating in the park downstairs from the building. Currently there are two suites available, details as follows: FREE inclusions with the rent: No fit out costs! Receptionist to greet your clients and man the reception desk, collect and send your mail, wi fi , electricity, air conditioning, cleaning, outgoings (rates, body corporate fees, gardening etc), bathroom, boardroom and kitchen supplies. If you think this might be the right fit or stepping stone for your business please contact Emily Pendleton to arrange your inspection or for further information. 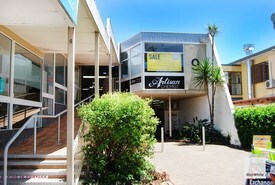 Office Fronting Pedestrian Crossing In Caloundra $25,000 + GST (Outgoings .. Approximately 25m2 Flexible month to month lease option available, or longer term on negotiation Serviced office space, one of 3 suits within the office Internal lift Located in the Ocean Central Building, between Duporth Avenue Ocean Street Rent your own office space for $300 per week including all costs You have use of all facilities including kitchen and boardroom No exclusive parking however nearby undercover parking available Please contact exclusive marketing agent Emily Pendleton on 0402 435 446 to arrange an inspection. Why base yourself in the CBD when you can be in Mooloolaba, right upstairs from quality retail, restaurants and cafes and across the road from the beach. 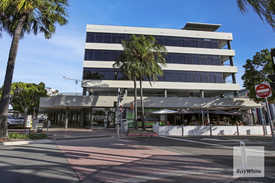 This high quality office is the only space in Mooloolaba where you have the option to negotiate up to 10 undercover car parking spaces with the tenancy. + Three car parking spaces included, up to ten available by negotiation + The rental price has been reduced, now available for $225 per square metre + outgoings + GST + 122sq m (approx) air conditioned premium first floor office + Open plan, carpeted space + Elevator access + Modern high quality building with excellent amenity to Mooloolaba dining and entertainment precinct + 123sq m (approx) adjacent tenancy also available for lease Call or email Louisa Blennerhassett to inspect the property or find out about other suitable options. Our team is strategically located in two offices across the Sunshine Coast region and is ready to handle your commercial, industrial and retail property needs today so call or email now. An opportunity exists to join Queensland Health in a brand new, state of the art building in the rapidly growing city of Maroochydore, Sunshine Coast. Ready for occupation now and with flexible space options, the building is located on a vital thoroughfare in close proximity to the emerging new CBD precinct. With the potential to secure the largest single floor plate in Maroochydore, it's the ideal place to create a commanding presence in a thriving region. Over 4,000 sq m (approx) of the building is already occupied by Queensland Health, who have approximately 250 staff on site and see up to 300 patients per day; it's a hive of activity. We are presenting the opportunity to secure either half or all of the entire top floor office space, with its A Grade shell, abundance of natural light and impressive views. + A Grade Office space up to 2,000sq m (approx) + Located on the busy Dalton Drive, adjacent to Arcare Aged Living and the Bunnings Officeworks retail development + Ample parking + Compelling views + 4,300sq m (approx) of office space already leased to Queensland Health + Attractive incentives available Call or email Louisa Blennerhassett or David Smith to arrange an inspection. Our team is strategically located in two offices across the Sunshine Coast region and is ready to handle your commercial, industrial and retail property needs today so call or email now. An opportunity exists to join Queensland Health in a brand new, state of the art building in the rapidly growing city of Maroochydore, Sunshine Coast. Ready for occupation now and with flexible space options, the building is located on a vital thoroughfare in close proximity to the emerging new CBD precinct. Over 4,000sq m (approx) of the building is already occupied by Queensland Health, who have approximately 250 staff on site and see up to 300 patients per day; it's a hive of activity. We are presenting the opportunity to secure a highly visible ground floor retail / medical or office space, which enjoys prominent street frontage and significant passing traffic. 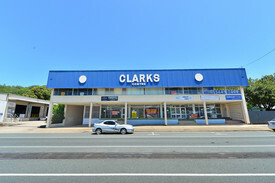 + Ground floor retail / office / medical space + Sizes ranging from 80sq m to 254sq m (sizes approx) + Visible location and commanding street frontage + High volume of foot traffic to the building + Located on the busy Dalton Drive, adjacent to Arcare Aged Living and the Bunnings Officeworks retail development + Ample parking + 4,300sq m (approx) of office space already leased to Queensland Health + Attractive incentives available Call or email Louisa Blennerhassett or David Smith to inspect the property or find out about other suitable options. Our team is strategically located in two offices across the Sunshine Coast region and is ready to handle your commercial, industrial and retail property needs today so call or email now. bull; First floor and ground floor opportunities available bull; Fully fitted out turn key tenancies bull; Would suit professional service and/or personal service tenants bull; Main road frontage bull; 65 off street car parks bull; Air conditioned bull; Minimal outgoings Ray White Commercial Northern Corridor Group is pleased to present North Shore/Mudjimba's Primary Commercial Development for Lease. Situated on the Corner David Low Way and Mudjimba Beach Road, set right in the heart of the existing Mudjimba shopping precinct, with corner and main road frontages, this development is highest profile developments in the region. Join Timari Street's, Pacific Paradise's street scape revitalisation and secure your position in this booming precinct. Contact exclusive marketing agent Emily Pendleton today to arrange your inspection! Emily Pendleton from Ray White Commercial Northern Corridor Group is pleased to present to the market for lease, 63m2 on the ground floor of 7 First Avenue, Maroochydore for the first time in a number of years, the opportunity to exists to secure this high profile, ground floor location for your business, conveniently located next to the old court house and opposite the bridge to Duporth Avenue in walking distance to the court house, banks, post office, Sunshine Plaza and the booming little Ocean Street precinct. 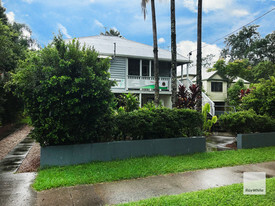 Only footsteps away from the new Maroochydore CBD you cannot simply go past this property. 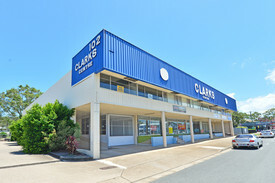 It boasts: 63m2 of ground floor retail space, with a good quality office fit out The landlord is flexible around fit out arrangements and happy to modify what is there Located in a prime position central to court house, council chambers banks, post office and new Maroochydore CBD Exclusive car parks at the rear and ample street car parking surrounding Excellent signage opportunities Contact exclusive marketing agent Emily Pendleton on 0402 435 446 to discuss the endless opportunities this property has to offer your business! 64m2 The best street facing position on Ocean Street in the Centrepoint Arcade Vacant and available for immediate occupation Beautiful glass shop front with ample signage opportunities Car parks available at the rear and on Ocean Street Located opposite the Big Top Shopping Centre on Ocean Street Positioned in the centre of the Maroochydore CBD in close walking distance to post office, restaurant/cafe's, courthouses, banks and shopping centres Don't miss out on being a part of the fresh and vibrant Ocean Street rejuvenation now promoting art, culture, music and food as a real hub for the Maroochydore CBD. This building is opposite the Big Top Shopping Centre home to major retailers and other venues such as Sol Bar, Machu Pichu Restaurant, Hello Harry and Post Office Restaurant. This property is located on the first floor of the Centrepoint Arcade with the best position in the complex offering huge signage exposure to brand your business. Contact exclusive marketing agent Emily Pendleton for further information or to arrange an inspection!